The Healing is Always Christ: FRIENDS, Accept God- Your Lord and Savior Jesus, the Messiah and Christ, Today! Be Sure to Go to Heaven with God! Easter, Good Friday, Every Day of Your Life into Forever! & A Salvation Prayer! FRIENDS, Accept God- Your Lord and Savior Jesus, the Messiah and Christ, Today! Be Sure to Go to Heaven with God! Easter, Good Friday, Every Day of Your Life into Forever! & A Salvation Prayer! If you have already accepted Jesus Christ as Your Lord and your Savior, Rejoice!! Praise Him! God inhabits the praises of His people. If you need to recommit, do so, please! You can get back on the right track, make a difference in your own life as well as your family's, loved ones, friends- and even your enemies- for the BEST. If you do not believe or have not fully accepted Christ (unsure, half-heartedly), oh, please do accept Him now! Death from this Earth? Assuredly! Only God knows how and when. You truly are not your own, folks. I did not bring myself into the world- this is my one life (no matter what some occult ideas say). I will die some day, and I know where I am going- straight to Heaven with my God, the Only One, the LORD Almighty~~~ I know that I am definitely joining my mother; I believe from our conversations and hope that my dad is awaiting me in Heaven; my Grandma and Grandpa Binder; my so sweet Grandpa McCoy, and I hope my Grandma McCoy, whom I adored my whole childhood; Uncle Jack and Aunt Velma; Uncle Paul and Aunt Helen; Aunts Virginia, Pearl, Ruth and Ruby and her husband- kind Uncle George (all of these aunts had Jesus-believing husbands who surely must be in Heaven); Aunt Opal, (twin to Ruby) who died as a very young child with Bright's Disease, whom I have not met yet; and Uncle Harry who died working in the oil fields with his dad and brothers before my mother was born, and the list goes on. Oh, I know certainly my close friend Cheryl Patton will be there because my husband and I saw her two times before her illness overcame her, and Cheryl nodded so happily and said, indeed, she believed in Jesus!! My beloved mentor, Phyllis Del Vecchio, whom Christ put in my life to harken me back to Him. She laughed and talked so joyfully about Jesus day in and day out as we taught together, and she answered my very curious and serious questions about Him to her... I cannot wait to see these loved ones! However, I am completely happy to stay here with the LORD for now, to stay with my blessed- my family, church, dear friends and Bible study, new friends to make and to meet- even the enemies of God. I intend to say and to do, including writing this blog I hold dear for Christ until He calls me to my true HOME with Him. Why Do We Say, Good Friday?! It is the darkest yet, most glorious day of our Lord and King, Christ Jesus- and for His believers! God was accomplishing what He knew that He would do for mankind, for us, before the foundations of the world- all of which and of whom He created. Lord Jesus, God the Father's Son, (the Son of God), was taking on all the sin that was or ever would be committed by His children. The Almighty God wanted His children to stay permanently in the Garden of Eden with Him and continue to walk in the cool of the day together, but we would choose to listen to the lying, deceitful serpent, Satan. Bible Gateway - find Scripture from the Bible, read commentaries, etc. God cannot have sin in His sight, for He is completely Holy, so He sent His most Beloved, His Son Jesus, the second part of the Trinity: Father, Son, and Holy Spirit- to live as the Only fully God/ fully Man Who ever was and ever shall be. Some called/call Jesus a Prophet- oh, my- He is much more than that. Jesus is the Living Water, the Bread of Life, I AM Who I AM, God. Jesus is still alive forevermore!!! There were other people who purported to be God. Where are they today? Are they alive? No, they are not. Not unless they changed and turned around completely, accepting Jesus Christ as their personal Lord and Savior, then when they put their trust and faith in Christ Jesus of Nazareth, in Heaven, Who is the same yesterday, today and forever, they~ any of those people~ indeed, are with Him forever and ever. Jesus was born of the virgin, young and sweet Mary, who was betrothed to Joseph. An angel visited each one to explain that Mary would have a Baby, Who would be the Promised One of their faith...they were Israelites, Jews. Joseph did not put Mary away as was the custom. Instead, they married but remained in abstinence from each other until Jesus was born. The Holy Spirit of God had come upon her to bring Baby Jesus to Earth for His great mission. The night before His crucifixion, Jesus sweated blood as He was praying to the Father in Gethsemane...Jesus knowing what would come the next day. Jesus would suffer like no one ever has because of the horrific treatment at the hands of those mocking, beating, and killing Him, but especially because Jesus did take ALL of OUR sin from each and every person ever born- past, present, and future. It was so awful and terrible that the Father had to look away from His Beloved Son, and then Jesus said, "Why has thou forsaken Me?" Jesus knew why, and as has been said thousands of times, Jesus could have called down thousands of His angels to rescue Him, but He did as the Father wanted. Jesus is God, also, so He wanted to give Himself to be crucified, buried and resurrected in three days to complete the at least 108 prophecies in the Bible about the One and Only Jesus Christ of Nazareth. His Blood shed on Good Friday is our guarantee of His Presence as a Jason Upton song says from The Sound of Heaven cd by David and Nicole Binion with The Lion of Judah by Jason. Jesus' Crucifixion, Death, and Resurrection Paid for You! Wiping that Sin Away Forever, for Your Eternal Life. Beloved People! Accept Jesus, the Christ and the Messiah, right now. Then, you know for absolutely sure- no second-guessing, those "little" worries that fly around your head, the unknowing and wondering, the lies that the devil most-assuredly is telling you- Satan knows your weaknesses well (he tricked Eve and Adam, and they were God's first people in the Garden of Eden! The LORD lovingly warned them...). We human beings are made in the image of our Creator, God. We are like Him, but we will never be Him. He was and always is. We are His most loved, created beings, whom He gives free will to choose. What an honor!! It is a mighty and amazing honor. I am so very thankful that He made Himself known to me, and I chose Him. Thinking that makes me cry with Joy, every day. Here is a Salvation Prayer. It does not have to be just-so, i.e., exact words...tell God in your own words, or please do use these. He knows your heart and every corner of your mind- your beauty, your dark thoughts- every cell in your body because He made you in His image. God loves you more than you can imagine, and it is much more than any human being or group of human beings are capable. I believe that Jesus died for me. He took the pain and the suffering to pay for my sin. He redeemed me! The blameless Jesus, the Lamb of God, arose from the grave three days later. He was here on earth and seen by hundreds of people. Days later He went to the Father in Heaven to sit at His right hand and to intercede for me and us. When I die, I want to be in Heaven with You. I thank you that Jesus went to Heaven so that now the Holy Spirit can live within me, my mind and heart- to guide, direct and comfort me. Help me walk with You each day, God. In Jesus' Name, Amen! Thank you lostseed.com for the picture of Jesus after the cross at Calvary where He was killed for our sins. It is entitled "Forgiven", and it is painted by Thomas Blackshear. 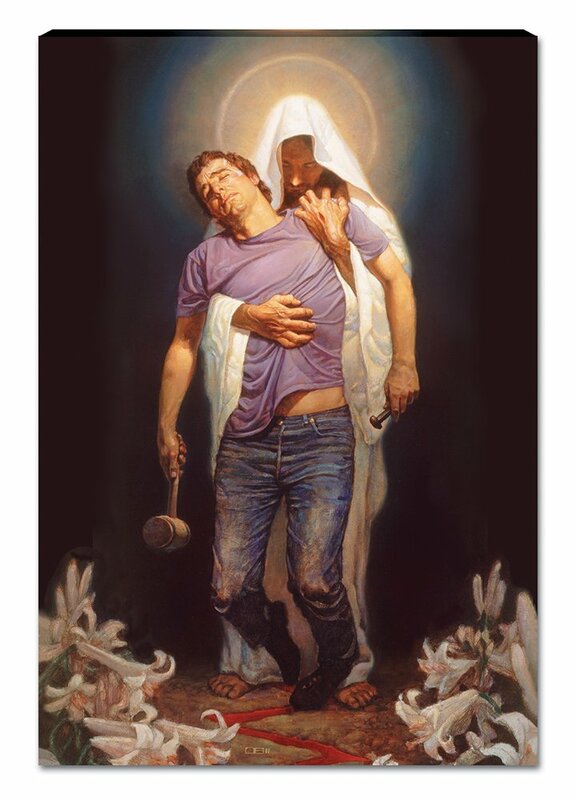 A young man, with the hammer he used to crucify the Lord and Savior, is depicted as falling into Jesus' arms with great remorse and the letting go, relenting, and submitting to the power of the Lord because He loves us and is greater than us. This is an essential part of accepting Christ. People who refuse to give themselves to Christ will not be saved. I urge YOU, please, accept the Redemption that Forgiveness that only He can give you. Step over that line to Him, Dear Friend, no matter what you have done. He will forgive you as though it never happened, indeed. God loves you exponentially, incalculably more! MOST!